Madame de Barra is a curiosity – a widowed woman gardener in seventeenth century France with the drive to make her visions a reality. When the unhappy gardening genius le Notre engages her to create a cutting-edge new al fresco ballroom for the King, it’s fairly obvious how it will all end. Directed by, co-written by and featuring Alan Rickman as the bored and pointless seventeenth century French King, trapped inside a suffocating cage and wanting only the one woman he can’t have, it’s a deceptively tranquil take on ageing, loss and love. Rickman’s trademark disdainful glower suits the all-powerful King, who temporarily strips off the royal persona along with his embroidered coat and enormous wig for a few moments’ freedom and privacy before the mask falls again. 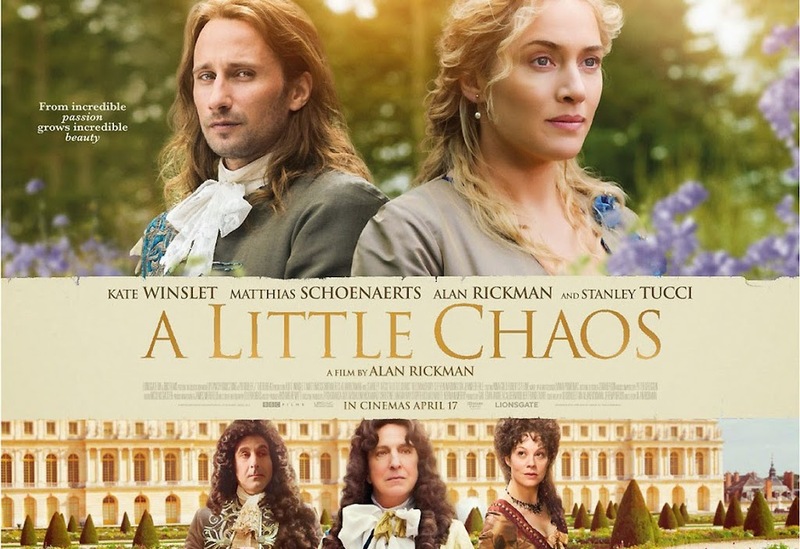 Kate Winslet (Divergent, Revolutionary Road) as the gardener Madame De Barra is robust, steady and solemn, her grief never allowing a flicker of a smile, her stolid presence a oddity among the ludicrously primped courtiers. She’s as entirely believable striding about in leather gardening corset, hefting filthy chunks of timber about, as she is having a panic attack in full court dress mode. Matthias Schoenaerts as André Le Notre is a handsome and enigmatic if slightly one-note love interest. Among the smaller roles, Jennifer Ehle as the King’s discarded mistress and Helen McCrory as le Notre’s discarded wife both blaze with the awareness that their beauty is faded and love must be hoped for or paid for, Steven Waddington as ally Thierry Duras adds a dash of salty Northern grit and Stanley Tucci (Hunger Games, Jack the Giant Slayer) as the King’s brother who’s worked everything out is great fun and has much the best lines. Throughout the film a muddy amphitheatre is gradually carved out of the wasteland into a topiaried marble-floored water feature. For a while, chaos looks likely to triumph but by the final shot – the last bit of wilderness sculpted, choreographed and shaped to fit in – all is safe, comfortable and tamed once more.